''USA has Issues with Maps of 18th century' analyses in detail the maps of 1771 edition of Encyclopedia Britannica and concludes that Northwestern part of United states of America was built on remains of Moscuvite Tartary, which according to Britannicaof 1771 was the biggest state in the world with capital in Tobolsk! The war of new Russian Epire of 1773-1775 with Moscuvite Tartary covered up by Catherine II as a raid against peasant rebellion headed by aka Pougatchev (scare in russian) was actually the final blow in destruction of Great Tartary. After the war of 1773-1775 the new Russian Empire has taken over Urals, Western and Eastern Siberia, Alaska, Northwestern America down to San Franciso. These 'russian' american territories were too far to control efficiently by the Rusian Empire and were therefore taken over step by step by USA and British Empire. 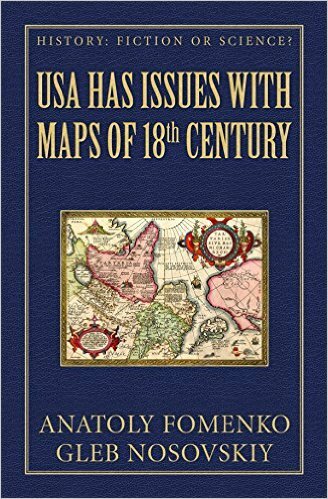 ''USA has Issues with Maps of 18th century' book is a part of kindle-series 'History: Fiction or Science?' series, which contains data, illustrations, charts and formulae containing irrefutable evidence of mathematical, statistical and astronomical nature. Feel free to use them in your eventual discussions with the avid devotees of classical chronology. In fact, before reading this book, you have most probably been one of such devotees. After reading History: Fiction or Science? you will develop a more critical attitude to the dominating historical discourse or even become its antagonist.You will be confronted with natural disbelief when you share what you’ve learned with others. Now you are very well armed in face of inevitable scepticism. This book contains enough solid evidence to silence any historian by the sheer power of facts and argumentation. History: Fiction or Science? is the most explosive tractate on history ever written – however, every theory it contains, no matter how unorthodox, is backed by solid scientific data. The dominating historical discourse in its current state was essentially crafted in the XVI century from a rather contradictory jumble of sources such as innumerable copies of ancient Latin and Greek manuscripts whose originals had vanished in the Dark Ages and the allegedly irrefutable proof offered by late mediaeval astronomers, resting upon the power of ecclesial authorities.Nearly all of its components are blatantly untrue! For some of us, it shall possibly be quite disturbing to see the magnificent edifice of classical history to turn into an ominous simulacrum brooding over the snake pit of mediaeval politics. Twice so, in fact: the first seeing the legendary millenarian dust on the ancient marble turn into a mere layer of dirt – one that meticulous unprejudiced research can eventually remove.The second, and greater, attack of unease comes with the awareness of just how many areas of human knowledge still trust the elephants, turtles and whales of the consensual chronology to support them. Nothing can remedy that except for an individual chronological revolution happening in the minds of a large enough number of people.